Getting around Austin isn't always easy. Most of the city's major roads have at least two names, making navigation confusing for those who are new to town. This list will help you make sense of Austin's many streets with multiple names. · MoPac Expressway (named after the Missouri Pacific railroad) and Loop 1 are the same thing. Locals just call it “MoPac.” Oh, and by the way, there is no loop despite the Loop 1 name. It's a north-south highway. 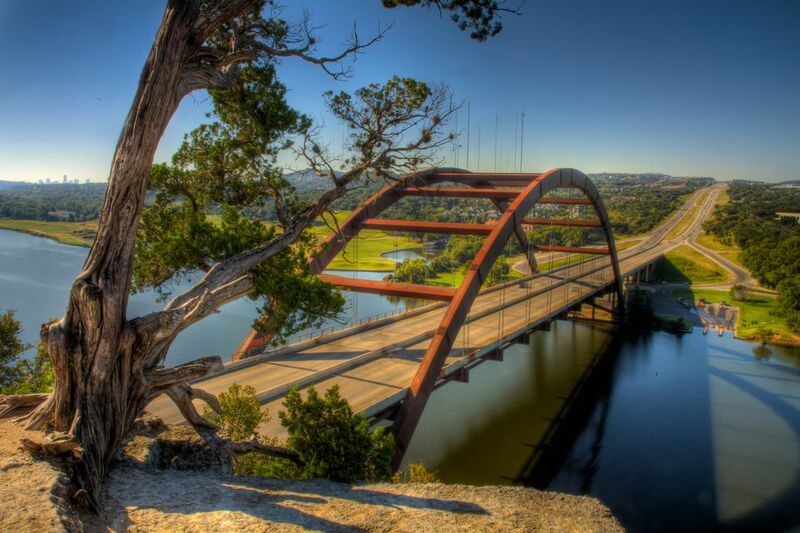 · Capital of Texas Highway is another name for Loop 360. Although Loop 360 is quite curvy, it is also not a loop, maybe a quarter loop at best, along the western side of town. · Highway 71 is also called Ben White Boulevard. Also, there's a stretch of Highway 71 that is part of Highway 290, but the "real" 290 departs from Austin on the northeast side of town. · Research Boulevard is the same thing as U.S. Route 183. At one point, 183 is called Anderson Lane, and in another section, Ed Bluestein Boulevard. · When 290 comes into Austin from Houston and hits I-35, it turns into Ranch Road 2222 and runs west out to Lake Travis. On the way, it is also known as Allandale, Northland and Koenig. · Ranch Road 2244 is the same thing as Bee Cave Road (sometimes called Bee Caves Road). It's singular because it's actually named after a single cave that once held a large bee colony. · Enfield Road and 15th Street are the same road. When you exit for 15th Street at MoPac, only the name Enfield is used, so this one is important! · Windsor is the same thing as 24th Street. MoPac’s exit for 24th Street only says Windsor. · Cesar Chavez and 1st Street are the same (east-west) road. However, South 1st is a major north-south road leading from downtown into deep south Austin. · Dean Keaton Street is the same thing as 26th Street in the campus area, though as soon as it goes onto the east side of I-35, it turns into Manor Road. And Manor is pronounced "Mayner" for reasons lost to history. · If you follow a map to 6th Street and end up on a bland residential street instead of the bustling entertainment district, you're probably on South 6th Street. Of course, on most street signs, the "South" is just a little "S" that can be easy to miss. · Manchaca Road keeps the same name throughout its diagonal route in south Austin, but it can be confusing because it's pronounced "Man-Chack." There's actually an effort under way to rename it Menchaca because the original name was basically a typo. · In downtown Austin, the north-south Congress Avenue marks the dividing line between streets that start with either “West” or “East.” Unfortunately, many locals tend to leave out these details when referring to common streets, such as 6th Street. The primary entertainment district is located on East 6th Street east of Congress Avenue. Since West 6th Street also has bars, it's easy for newcomers to get the two confused. Some GPS navigating systems also overlook this important detail. Presenting a whole new wrinkle in the confusing street-name sage, several streets are in the process of being renamed due to changing views of our history. Several streets around Austin have long been named after historical figures from the Civil War, but that is slowly changing. Robert E. Lee Road in south Austin is now Azie Morton Road. A long-time Austin resident, Azie Morton was the first African American to serve as the United States Treasurer. In north Austin, Jeff Davis Avenue is still in the process of being renamed William Holland Avenue. Holland was an African-American school teacher, county commissioner and a state representative. As these changes roll out, mapping services such as Google Maps and Waze will no doubt be glitchy for a while. And the people who’ve lived in these neighborhoods will also have a period of adjustment. While some people see this as a necessary righting of a historical wrong, other community members see it as revisionist history. A retired judge and history buff started an effort several years ago to change Manchaca Road to Menchaca Road because, he argued, that the road was supposed to have been named for a man named Menchaca who was a hero of the Texas Revolution. The exact origin of the name has never been 100% proven, however. Others point out there is a similar Native American word, manchac, and there is a bayou named after that version of manchac in Lousiana. In late 2018, the judge succeeded in getting the name change approved by city council. But business owners in the area, many with Manchaca in the name, have started an effort of their own to stop the change. In early 2019, the legal wrangling continues, and no signs have been changed just yet. Killer Bees in Austin: Fact or Fiction?